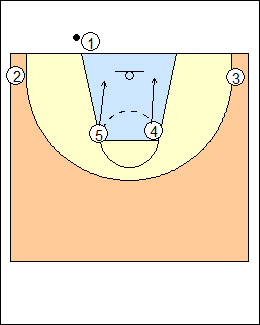 Four baseline inbounds plays that start with the same alignment. 1 inbounds. On the slap of the ball, 5 rolls out to his left, getting a good angle to stagger screen with 4 for shooter 2, who first fakes a downscreen for 3 then runs off the stagger screen. 3 gets out to the weakside corner. 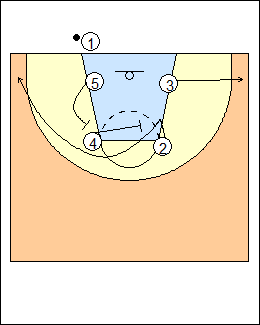 Don Meyer - triple - 3 turns to upscreen for 2, if 2 uses the 4-5 stagger, 3 turns and cuts to the corner; if 2 uses 3's screen, 3 uses the 4-5 stagger screen. 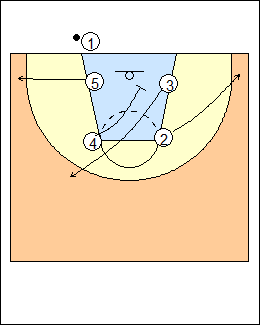 Fran Fraschilla - stagger slips - 3 backscreens for 2, who cuts to the weakside block, 4 and 5 stagger screen for 3, who runs to the ballside corner for a 3-pointer, 4 and 5 slip. 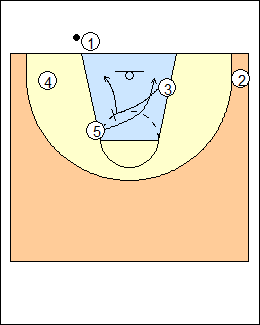 VCU - 3 backscreens for 2 who uses it, 3 uses the stagger, 5 screens for 4 and seals if defenders switch. 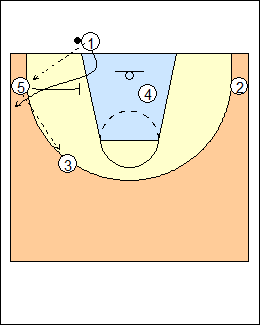 4 dives weakside, 5 dives ballside (flooding the baseline), 3 is the safety, sprinting towards halfcourt if the play is well defended. See Inbounds - Baseline Ashbury, Pop, March Madness, Golden State (rip, double, LA). 2 sprints to the weakside corner, 5 rolls out, getting a good angle to screen for 4, who fakes going the opposite direction then uses the screen, going wide to the corner if he can shoot or otherwise to the short corner (shown). 3 backscreens for 5 then dives ballside. See Versoix (option 2), Wootten (box 4), Nash box. 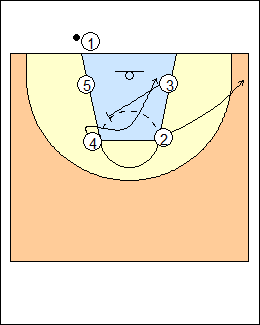 2 sprints to the weakside corner, 3 backscreens for 4, who sells opposite then comes off the screen to the weakside block area. 5 rolls out to get a good screening angle for 3, then dives ballside (where he started). 2 is the safety. See Versoix (option 1), Golden State (weak). Brendan Malone - New York - 2 would be out top as safety, 1 passes to 3 and enters the court, 3 passes to 2, 4 screens for a pass to 1, who can shoot or pass inside to 4. See Bologna for other options. 2 gets to the weakside corner, 5 pops out to the ballside corner, 4 diagonal downscreens for 3 then seals for post position, 3 comes out behind the arc near the ballside elbow area. 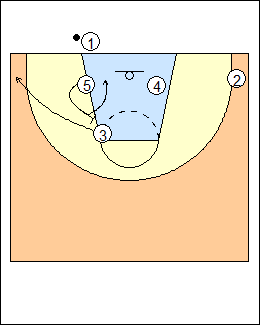 5 gets the inbounds pass, quickly reverses the ball to 3 and downscreens for 1, 3 looks for 4 then 1. See Ashbury (shooter), Liberty, Hal, Faucher (intermediate), Pin-screen.